This article is about the society. For the Belgian band, see Flat Earth Society (band). A flat Earth model depictingAntarctica as an ice wall surrounding a disk-shaped Earth. Modern flat Earth hypotheses originated with the English writer Samuel Rowbotham (1816–1884). Based on his conclusions derived from the Bedford Level experiment, Rowbotham published a 16-page pamphlet, Zetetic Astronomy, which he later expanded into a 430-page book, Earth Not a Globe, in which the Earth is a flat disc centred at the North Pole and bounded along its southern edge by a wall of ice (Antarctica), with the Sun and Moon 3,000 miles (4,800 km) and the “cosmos” 3,100 miles (5,000 km) above Earth. He also published a leaflet entitled “The inconsistency of Modern Astronomy and its Opposition to the Scriptures! !“, which argued that the “Bible, alongside our senses, supported the idea that the earth was flat and immovable and this essential truth should not be set aside for a system based solely on human conjecture”. Rowbotham and followers like William Carpenter, who continued the belief, gained attention by successful use of pseudoscience in public debates with leading scientists of the day. One such debate, involving Alfred Russel Wallace, concerned the Bedford Level experiment (and later led to several lawsuits for fraud and libel). Rowbotham created a Zetetic Society in England and New York, shipping over a thousand copies of Zetetic Astronomy. After Rowbotham’s death, Lady Elizabeth Blount, wife of explorer Sir Walter de Sodington Blount, established a Universal Zetetic Society, whose objective was “the propagation of knowledge related to Natural Cosmogony in confirmation of the Holy Scriptures, based on practical scientific investigation”. The society published a magazine, The Earth Not a Globe Review, and remained active well into the early 20th century. A flat Earth journal, Earth: a Monthly Magazine of Sense and Science, was published between 1901–1904, edited by Lady Blount. In 1956, Samuel Shenton, a songwriter by trade, created the International Flat Earth Society as a successor to the Universal Zetetic Society and ran it as “organizing secretary” from his home in Dover, England. Given Shenton’s interest in alternative science and technology, the emphasis on religious arguments was less than in the predecessor society. When satellite images showed Earth as a sphere, Shenton remarked: “It’s easy to see how a photograph like that could fool the untrained eye”. The society also claimed that the Apollo Moon landings were a hoax staged by Hollywood (a position also held outside the Flat Earth Society). In 1969, Shenton persuaded Ellis Hillman, a Polytechnic lecturer, to become president of the Flat Earth Society; but there is little evidence of any activity on his part until after Shenton’s death, when he added most of Shenton’s library to the archives of the Science Fiction Foundation he helped to establish. Historical accounts and spoken history tell us the Land part may have been square, all in one mass at one time, then as now, the magnetic north being the Center. Vast cataclysmic events and shaking no doubt broke the land apart, divided the Land to be our present continents or islands as they exist today. One thing we know for sure about this world…the known inhabited world is Flat, Level, a Plain World. Shenton died in 1971; Charles K. Johnson, inheriting part of Shenton’s library from Shenton’s wife, established and became president of the International Flat Earth Research Society of America and Covenant People’s Church in California. Under his leadership, over the next three decades, the Flat Earth Society grew from a few members to a reported 3,500. Johnson gave newsletters, flyers, maps, and other publications to anyone who asked for them, and managed all membership applications together with his wife, Marjory. The most famous of these newsletters was Flat Earth News. Johnson paid for these publications through annual member dues costing US$6 to US$10 over the course of his leadership. Johnson’s beliefs were based on the Bible, and he saw scientists as pulling a hoax which would replace religion with science. The Flat Earth Society’s most recent world model is that humanity lives on a disc, with the North Pole at its center and a 150-foot (45 m) high wall of ice (Antarctica) at the outer edge. The resulting mapresembles the symbol of the United Nations, which Johnson used as evidence for his position. In this model, the Sun and Moon are each 32 miles (52 km) in diameter. Flat Earth Society recruited members by speaking against the U. S. government and all its agencies, particularly NASA. Much of the society’s literature in its early days focused on interpreting the Bible to mean that the Earth is flat, although they did try to offer scientific explanations and evidence. Flat Earth News, was a quarterly, four-page tabloid. The group rose to 3,500 members under Charles K. Johnson. Later, “Flat-earther” became a common epithet for someone who stubbornly adheres to discredited or outmoded ideas. Eugenie Scott called them an example of “extreme Biblical-literalist theology: The earth is flat because the Bible says it is flat, regardless of what science tells us”. The society was further affected by a fire at the house of Charles K. Johnson which destroyed all of the records and contacts of members of the Society. Johnson’s wife, who helped manage the database, died shortly thereafter. Johnson himself died on March 19, 2001. In 2004, Daniel Shenton (not related to Samuel) resurrected the Flat Earth Society, basing it around a web-based discussionforum. This eventually led to the official relaunch of the society in October 2009, and the creation of a new website, featuring the world’s largest public collection of Flat Earth literature and a user-edited encyclopedia. Moreover, the society began accepting new members for the first time since 2001, with musician Thomas Dolby becoming the first member to join the newly reconvened society. As of July 2014, over 500 people have become members. Shenton has also conducted several interviews since the society’s relaunch, including in The Guardian newspaper. In the 1980s, talk show host Wally George often ridiculed Flat Earth Society members on his show Hot Seat; and Australian talk show host Don Lane also had Flat Earth Society advocates on his show. California-based punk rock band Bad Religion include a song titled “Flat Earth Society”, by Brett Gurewitz, on their album Against the Grain (1990). Richard A. Lupoff‘s novel Circumpolar! describes a flat planet much like the Earth as described by Flat Earth Society, except it has a hole at the centre instead of a North Pole, and the underside contains fictional lands such as Atlantis and Lemuria. While discussing the importance of acting on climate change, President Barack Obama said there was no time for “a meeting of the flat-earth society” in reference to climate change deniers. Nick Davies wrote “Flat Earth News” in which he names and exposes the national news stories which turn out to be pseudo events manufactured by the PR industry and the global news stories which prove to be fiction generated by a new machinery of international propaganda. This article is about the modern myth that medieval Europeans believed the Earth was flat. For mythologies involving the belief in a Flat Earth, see Flat Earth. 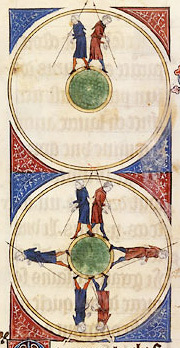 Illustration of the spherical Earth in a 14th-century copy ofL’Image du monde (ca. 1246). During the early Middle Ages, virtually all scholars maintained the spherical viewpoint first expressed by the Ancient Greeks. From at least the 14th century, belief in a flat Earth among the educated was almost nonexistent, despite fanciful depictions in art, such as the exterior of Hieronymus Bosch‘s famous triptych The Garden of Earthly Delights, in which a disc-shaped Earth is shown floating inside a transparent sphere. Historian Jeffrey Burton Russell says the flat-earth error flourished most between 1870 and 1920, and had to do with the ideological setting created by struggles over evolution. Russell claims “with extraordinary few exceptions no educated person in the history of Western Civilization from the third century B.C. onward believed that the earth was flat”, and ascribes popularization of the flat-earth myth to histories by John William Draper, Andrew Dickson White, and Washington Irving. The myth that people in the Middle Ages thought the earth is flat appears to date from the 17th century as part of the campaign by Protestants against Catholic teaching. But it gained currency in the 19th century, thanks to inaccurate histories such as John William Draper’s History of the Conflict Between Religion and Science (1874) and Andrew Dickson White’s A History of the Warfare of Science with Theology in Christendom (1896). Atheists and agnostics championed the conflict thesis for their own purposes, but historical research gradually demonstrated that Draper and White had propagated more fantasy than fact in their efforts to prove that science and religion are locked in eternal conflict. Virgil, sometimes bishop of Saltburg (as Aventinus anno 745 relates) by Bonifacius bishop of Mentz was therefore called in question, because he held antipodes (which they made a doubt whether Christ died for) and so by that means took away the seat of hell, or so contracted it, that it could bear no proportion to heaven, and contradicted that opinion of Austin [St. Augustine], Basil, Lactantius that held the earth round as a trencher (whom Acosta and common experience more largely confute) but not as a ball. In 1828, Washington Irving’s highly romanticised biography, A History of the Life and Voyages of Christopher Columbus,was published and mistaken by many for a scholarly work. In Book III, Chapter II of this biography, Irving gave a largely fictional account of the meetings of a commission established by the Spanish sovereigns to examine Columbus’s proposals. One of his more fanciful embellishments was a highly unlikely tale that the more ignorant and bigoted members on the commission had raised scriptural objections to Columbus’s assertions that the Earth was spherical. The issue in the 1490s was not the shape of the Earth, but its size, and the position of the east coast of Asia, as Irving in fact points out. Historical estimates from Ptolemyonwards placed the coast of Asia about 180° east of the Canary Islands. Columbus adopted an earlier (and rejected) distance of 225°, added 28° (based on Marco Polo’stravels), and then placed Japan another 30° further east. Starting from Cape St. Vincent in Portugal, Columbus made Eurasia stretch 283° to the east, leaving the Atlantic as only 77° wide. Since he planned to leave from the Canaries (9° further west), his trip to Japan would only have to cover 68° of longitude. Columbus mistakenly assumed that the mile referred to in the Arabic estimate of 56⅔ miles for the size of a degree was the same as the actually much shorter Italian mile of 1,480 m. His estimate for the size of the degree and for the circumference of the Earth was therefore about 25% too small. The combined effect of these mistakes was that Columbus estimated the distance to Japan to be only about 5,000 km (or only to the eastern edge of the Caribbean) while the true figure is about 20,000 km. The Spanish scholars may not have known the exact distance to the east coast of Asia, but they believed that it was significantly further than Columbus’ projection; and this was the basis of the criticism in Spain and Portugal, whether academic or amongst mariners, of the proposed voyage. The disputed point was not the shape of the Earth, nor the idea that going west would eventually lead to Japan and China, but the ability of European ships to sail that far across open seas. The small ships of the day (Columbus’ three ships varied between 20.5 and 23.5 m – or 67 to 77 feet – in length and carried about 90 men) simply could not carry enough food and water to reach Japan. The ships barely reached the eastern Caribbean islands. Already the crews were mutinous, not because of some fear of “sailing off the edge”, but because they were running out of food and water with no chance of any new supplies within sailing distance. They were on the edge of starvation. What saved Columbus was the unknown existence of the Americas precisely at the point he thought he would reach Japan. His ability to resupply with food and water from the Caribbean islands allowed him to return safely to Europe. Otherwise his crews would have died, and the ships foundered. In 1834, a few years after the publication of Irving’s book, Jean Antoine Letronne, a French academic of strong antireligious ideas, misrepresented the church fathers and their medieval successors as believing in a flat earth in his On the Cosmographical Ideas of the Church Fathers. Then in 1837, the English philosopher of science William Whewell, in his History of the Inductive Sciences, identified Lactantius, author of Institutiones Divinae (c. 310), and Cosmas Indicopleustes, author of Christian Topography (c. 548), as evidence of a medieval belief in a Flat Earth. Lactantius had been ridiculed much earlier by Copernicus in De revolutionibus of 1543 as someone who “Speaks quite childishly about the Earth’s shape, when he mocks those who declared that the Earth has the form of a globe”. Other historians quickly followed Whewell, although they could identify few other examples. The American chemist John William Draper wrote a History of the Conflict between Religion and Science (1874), employing the claim that the early Church fathers thought the earth was flat as evidence of the hostility of the Church to the advancement of science. The story of widespread religious belief in the flat earth was repeated by Andrew Dickson White in his 1876 The Warfare of Science and elaborated twenty years later in his two-volume History of the Warfare of Science with Theology in Christendom, which exaggerated the number and significance of medieval flat earthers to support White’s model of warfare between dogmatic theology and scientific progress. As Draper and White’s metaphor of ongoing warfare between the scientific progress of the Enlightenment and the religious obscurantism of the “Dark Ages” became widely accepted, it spread the idea of medieval belief in the flat earth. The widely circulated engraving of a man poking his head through the firmament surrounding the Earth to view the Empyrean, executed in the style of the 16th century, was published in Camille Flammarion‘s L’Atmosphère: Météorologie Populaire (Paris, 1888, p. 163). The engraving illustrates the statement in the text that a medieval missionary claimed that “he reached the horizon where the Earth and the heavens met”. 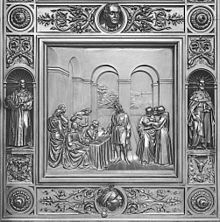 In its original form, the engraving included a decorative border that places it in the 19th century. In later publications, some claiming that the engraving did, in fact, date to the 16th century, the border was removed. 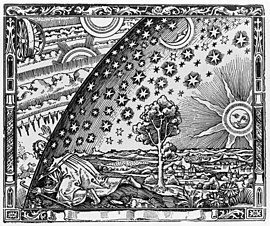 Flammarion, according to anecdotal evidence, had commissioned the Flammarion engraving himself. Since the early 20th century, a number of books and articles have documented the flat earth error as one of a number of widespread misconceptions in popular views of the Middle Ages. Both E.M.W. Tillyard’s book The Elizabethan World Picture and C.S. Lewis’ The Discarded Image are devoted to a broad survey of how the universe was viewed in Renaissance and medieval times, and both extensively discuss how the educated classes knew the world was round. Lewis draws attention to the fact that in Dante’s The Divine Comedy about an epic voyage through hell, purgatory, and heaven, the earth is spherical with gravity being towards the center of the earth. As the devil is frozen in a block of ice in the center of the earth, Dante and Virgil climb down the devil’s torso, but up from the devil’s waist to his feet, as his waist is at the center of the earth. Previous editions of Thomas Bailey‘s The American Pageant stated that “The superstitious sailors [of Columbus’ crew] … grew increasingly mutinous … because they were fearful of sailing over the edge of the world”; however, no such historical account is known. As recently as 1983 Daniel Boorstin published a historical survey, The Discoverers, which presented the Flammarion engraving on its cover and proclaimed that “from AD 300 to at least 1300 … Christian faith and dogma suppressed the useful image of the world that had been so … scrupulously drawn by ancient geographers.” Boorstin dedicated a chapter to the flat earth, in which he portrayed Cosmas Indicopleustes as the founder of Christian geography. The 1937 popular song, They All Laughed contains the couplet “They all laughed at Christopher Columbus/When he said the world was round”. In the Warner Bros. Merrie Melodies cartoon Hare We Go (1951) Christopher Columbus and Ferdinand the Catholic quarrel about the shape of the Earth; the king states the Earth is flat. In Walt Disney’s 1963 animation The Sword in the Stone, wizard Merlin (who has traveled into the future) explains to a young Arthur that “man will discover in centuries to come” that the Earth is round, and rotates. Historical writers have identified a number of historical circumstances that contributed to the origin and widespread acceptance of the flat-earth myth. American historian Jeffrey Burton Russell traced the nineteenth-century origins of what he called the Flat Error to a group of anticlerical French scholars, particularly to Antoine-Jean Letronne and, indirectly, to his teachers Jean-Baptiste Gail and Edme Mentelle. Mentelle had described the Middle Ages as twelve ignorant centuries of “profound night”, a theme exemplified by the flat-earth myth in Letronne’s “On the Cosmological Opinions of the Church Fathers”. Historian of science Edward Grant saw a fertile ground for the development of the flat-earth myth in a more general assault upon the middle ages and upon scholastic thought, which can be traced back to Francesco Petrarch in the fourteenth century. Grant sees “one of the most extreme assaults against the Middle Ages” in Draper’s History of the Intellectual Development of Europe, which appeared a decade before Draper presented the flat-earth myth in his History of the Conflict Between Religion and Science. Andrew Dickson White’s motives were more complex. As the first president of Cornell University, he had advocated that it be established without any religious ties but be “an asylum for science”. In addition, he was a strong advocate for Darwinism, saw religious figures as the main opponents of the Darwinian evolution, and sought to project that conflict of theology and science back through the entire Christian Era. But as some historians have pointed out, the nineteenth-century conflict over Darwinism incorporated disputes over the relative authority of professional scientists and clergy in the fields of science and education. White made this concern manifest in the preface to his History of the Warfare of Science and Theology in Christendom, where he explained the lack of advanced instruction in many American colleges and universities by their “sectarian character”. The flat-earth myth, like other myths, took on artistic form in the many works of art displaying Columbus defending the sphericity of the Earth before the Council of Salamanca. American artists depicted a forceful Columbus challenging the “prejudices, the mingled ignorance and erudition, and the pedantic bigotry” of the churchmen. Abrams sees this image of a Romantic hero, a practical man of business, and a Yankee go-getter as crafted to appeal to nineteenth-century Americans. Russell suggests that the flat-earth error was able to take such deep hold on the modern imagination because of prejudice and presentism. He specifically mentions “the Protestant prejudice against the Middle Ages for Being Catholic … the Rationalist prejudice against Judeo-Christianity as a whole”, and “the assumption of the superiority of ‘our’ views to those of older cultures”. In 2003, the Annals of Improbable Research released the results of a study that was not so much groundbreaking as it was ground-battering: Kansas, the tongue-in-cheek analysis found, was flatter than a pancake. The researchers Mark Fonstad, William Pugatch, and Brandon Vogt used polynomial equations to calculate the flatness of the famously flat state, and discovered that—as compared to the topography of an IHOP pancake—it was indeed flatter than a flapjack. Their finding was not incorrect. Parts of Kansas are, in fact, flatter than a pancake! But the study’s focus on Kansas, it turns out, was also misleading. Because there are states—six of them, to be specific—that are even flatter than Kansas. The states flatter than a pancake, you could say, could be served in a short stack. This latest flatness finding comes courtesy of geographers at the University of Kansas, who just published a paper, “The Flatness of U.S. States,” in Geographical Review, a peer-reviewed journal published by the American Geographical Society. KU Professor Jerome Dobson and his colleague Joshua Campbell, who works at the State Department’s Office of the Geographer, conducted a “geomorphometric analysis” of the contiguous United States—a measure, basically, of the nation’s lumps and bumps. To do that, the pair developed a method for reckoning flatness, creating an algorithm that would allow them to develop a comprehensive estimate of states’ relative pancakery. While driving across the American Midwest, it is common to hear travelers remark, “This state is as flat as a pancake.” To the authors, this adage seems to qualitatively capture some characteristic of a topographic geodetic survey 2. This obvious question “how flat is a pancake” spurned our analytical interest, and we set out to find the ‘flatness’ of both a pancake and one particular state: Kansas. Barring the acquisition of either a Kansas-sized pancake or a pancake-sized Kansas, mathematical techniques are needed to do a proper comparison. Some readers may find the comparing of a pancake and Kansas to be analogous to the comparing of apples and oranges; we refer those readers to a 1995 publication by NASA’s Scott Sandford 3, who used spectrographic techniques to do a comparison of apples and oranges. One common method of quantifying ‘flatness’ in geodesy is the ‘flattening’ ratio. The length of an ellipse’s (or arc’s) semi-major axis a is compared with its measured semi-minor axis b using the formula for flattening, f = (a – b) / a. A perfectly flat surface will have a flattening f of one, whereas an ellipsoid with equal axis lengths will have no flattening, and f will equal zero. For example, the earth is slightly flattened at the poles due to the earth’s rotation, making its semi-major axis slightly longer than its semi-minor axis, giving a global f of 0.00335. For both Kansas and the pancake, we approximated the local ellipsoid with a second-order polynomial line fit to the cross-sections. These polynomial equations allowed us to estimate the local ellipsoid’s semi-major and semi-minor axes and thus we can calculate the flattening measure f.
We purchased a well-cooked pancake from a local restaurant, the International House of Pancakes, and prepared it for analysis by separating a 2-cm wide sample strip that had not had time to desiccate. We collected macro-pancake topography through digital image processing of a pancake image and ruler for scale calibration (see Figure 2). Figure 2. Pancake cross-sectional surface being digitized. We made another topographic profile from the sample, using a confocal laser microscope. The importance of this research dictated that we not be daunted by the “No Food or Drink” sign posted in the microscopy room. The microscope collects one elevation point every 10 mm and has a maximum surface diameter of 2 cm (see Figure 3). Figure 3. When viewed at a scale of 50 mm, a pancake appears more rugged than the Grand Canyon. We measured a west-east profile across Kansas taken from merged 1:250,000 scale digital elevation model (DEM) data from the United States Geological Survey. In general, the spacing between adjacent elevation points on the landscape transects was approximately 90 meters. We extracted surface transects and flatness estimates from the Kansas and pancake DEM data using a geographic information system. The topographic transects of both Kansas and a pancake at millimeter scale are both quite flat, but this first analysis showed that Kansas is clearly flatter (see Figure 4). Figure 4. Surface topography of Kansas and of a pancake. Mathematically, a value of 1.000 would indicate perfect, platonic flatness. The calculated flatness of the pancake transect from the digital image is approximately 0.957, which is pretty flat, but far from perfectly flat. The confocal laser scan showed the pancake surface to be slightly rougher, still. Simply put, our results show that Kansas is considerably flatter than a pancake.